Design services are vital to the success of any remodeling project. That is especially true for kitchens and bathrooms. It’s important to choose a company with a proven design team. Our designers are seasoned and successful. They’re broadly trained in current design tools and techniques that empower them when a project gets challenging. These tools bring projects to life. Your kitchen doesn’t exist in a vacuum. It’s part of a bigger picture. Our designers will create an integrated design aesthetic throughout your entire home. Timing is also important. We understand how to coordinate construction to maximize efficiency, lower costs and decrease project time. Christie’s has over 30 years of experience in home renovation and a family of happy clients. We want to make you our next satisfied homeowner. Contemporary, Traditional, Victorian, French Country, and more! 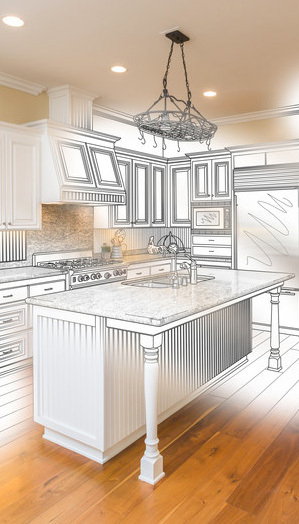 Christie’s kitchen design services begin with a free consultation. You have instant access to our team’s extensive knowledge gained through decades in the kitchen industry. Meet us in our showroom on Venice island or we’ll come to your home. We’ll get to know you and identify your aesthetic goals and budget. While we present our product selection and explain our workmanship, you’ll get to know us too. Our goal for the first meeting is to gather information to begin designing your project. We’ll discuss our process and your schedule, too. The next important step is the project site visit. We’ll visit your home before producing drawings so we know what we’re working with. We need to verify measurements and existing appliances. It’s also important to record lighting and plumbing locations. During our site visit, we’ll make sure the project is feasible and make any necessary suggestions. When your drawings and renderings are ready, we’ll invite you to review the plans in our showroom. Select from extensive manufacturer samples of cabinets, door styles, finishes, trims, accessories, and counters. If your project involves more than cabinets and counters, we’ll review flooring, plumbing and electrical options. When you’re happy, we’ll deliver a written proposal and schedule. 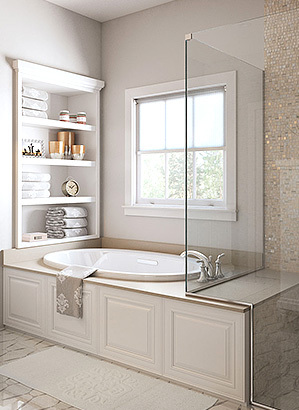 We take the same care with design services for bathrooms. The process is similar. First, meet with our team for a free design services consultation. Get to know our team and explain your needs and style. They’ll create a preliminary plan and present that to you. Then take a trip to our showroom to pick out your materials and make final project decisions. Finally, our expert design services professionals will create blueprints for the build.